Autosole Economy is set in a wooden building, 3 km from Riga’s Old Town. Guests are welcome to use Wi-Fi in public areas free of charge. All rooms at Autosole are decorated with light and warm colours. Each features a TV with satellite channels, a refrigerator and a desk. Every private bathroom comes with a hairdryer and free toiletries. Some rooms boast a sauna. Breakfast is served daily at Autosole Economy and it is possible to order snacks and drinks 24 hours a day. Guests can relax in a garden or at a terrace on site. It is also possible to store the luggage, free of charge. 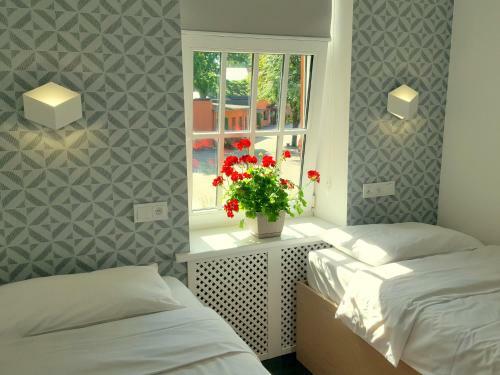 The Autosole is situated 6 km from Riga Airport and the airport shuttle is available at a surcharge. Saliena Golf Complex is 13 km away. The resort city of Jurmala can be reached in 15 minutes by car. Děti jsou v hotelu vítány. Za použití stávajících postelí pro všechny děti do 7 let se neplatí. Za dětskou postýlku pro 1 dítě do 2 let se platí 15 EUR na osobu a noc. Za přistýlku pro 1 starší dítě nebo dospělého se platí 15 EUR na osobu a noc. Maximální počet přistýlek/dětských postýlek na pokoji je 1.